Explore the types of chemical reactions, mole ratios, and stoichiometric equivalents which are central to all chemical calculations. Students perform a series of experiments including an electrochemistry decomposition reaction, single replacement reactions, and double replacement reactions. Students are encouraged to predict possible products, as well as write and balance equations representing the reactions. Students will discover the quantitative nature of chemical equations and the experimental basis of numerically balancing coefficients. 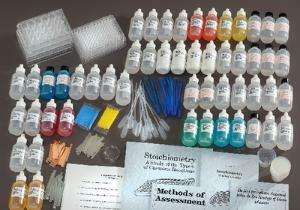 Kit includes a lab quiz, all required chemicals and supplies for performing experiments on a microscale. Required, but not included: 9V batteries with clips and leads. Kit includes Lead Nitrate.